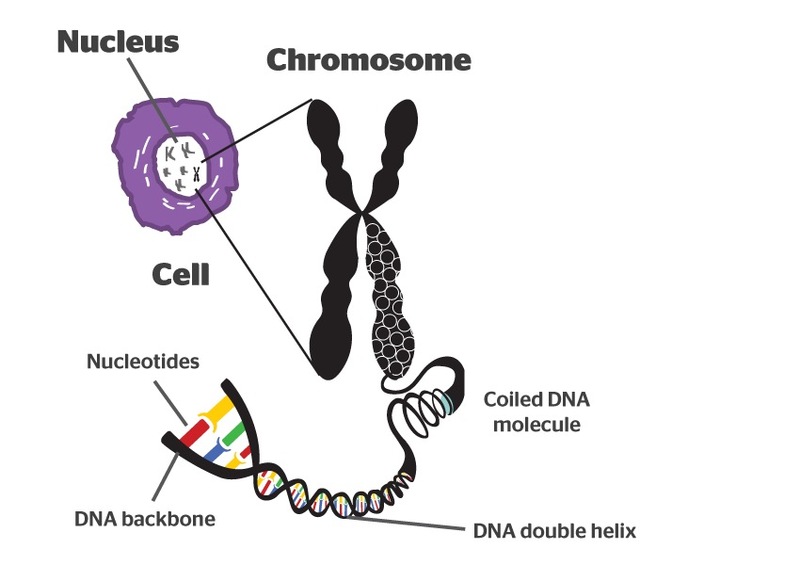 If we were to extended DNA molecules, they would be very long, however DNA is instead coiled and packaged in structures called chromosomes, which in turn are contained in the nucleus of the cell. Different species have different numbers of chromosomes (humans have 46 chromosomes, or 23 sets of chromosome pairs; peas have 14 chromosomes or 7 pairs; and tomatoes 24 chromosomes or 12 pairs). In sexual reproduction, one chromosome in each pair is contributed by each parent. Each chromosome has a narrowing point called centromere, which divides the chromosome into two sections, or “arms.” The short arm of the chromosome is labeled the “p arm.” The long arm of the chromosome is labeled the “q arm.” The location of the centromere on each chromosome gives the chromosome its characteristic shape, and can be used to help describe the location of specific genes.